Lizzing Lightly: Tips to make a delicious curry - every time! Tips to make a delicious curry - every time! One of the main things I love about cooking is creating a unique dish. 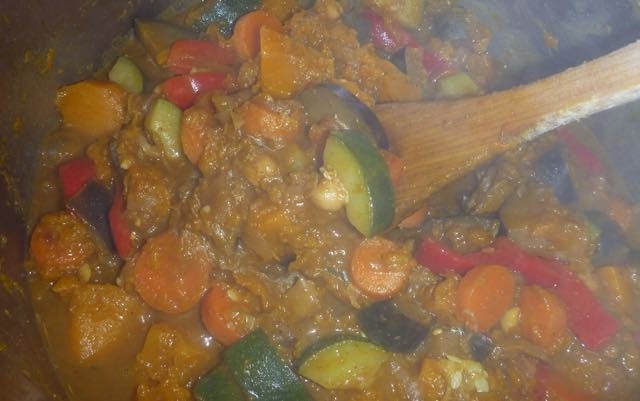 Making curry is a favourite since I use different vegetables, or a different ratio of spices, which makes it a bit of an adventure each time. There was a time when I would never have considered making a curry from scratch. I would have picked a pre-made sauce off a shelf in the supermarket, thrown it in with some meat and vegetables and that would have been the end of it. The reason I make my own now is that it is easy, cheap and delicious. After you stock up on spices then you are set for many (even hundreds) of curries whenever it takes your fancy. As I have already said, I actually quite enjoy the cooking part too. Please keep in mind that I am by no means an expert on cooking curries. I started cooking curry by randomly throwing spices into the pot and letting them work their magic as they simmered away. This would result in either a delicious meal or an average tasting dish. I rarely found the meal to be terrible, despite my lack of knowledge, so I can attest to cooking curry as being quite a simple thing to do. I encourage you to give it a go! We often make vegetarian curry but the tips below apply to making meat curry too. I recommend the vegetables and the flavour being the main stars of the dish and to treat meat as an add on if you do use it. This is how we often use meat when we do eat it. As a protein source as part of a dish, rather than the key element. Since meat is resource intensive, and expensive, this results in a diet that has less impact on the environment and it saves money too. Over time I have learnt to do a few things to make sure my curry turns out well, sometimes even spectacularly, every time. On a recent trip to Adelaide I made curry for the family and my mum wanted to find out how I had done it. This was what gave me the idea for this post. I have decided to share these tips with you too - please use them well. In these weight obsessive times we often don't receive good advice like this - use enough oil, butter, ghee or whatever it is that you are using to fry up your ingredients. I tend to use olive oil since that is what we have on hand. Ghee is the traditional choice for Indians so if you're going for the authentic flavour then use that. I find that having enough oil means that the spices don't stick and burn in the pan. This improves the curry flavour by releasing the spices on the heat in a moist paste. I probably use around 4 to 5 tablespoons of olive oil. If it starts to dry out after I add the spices then I throw another couple of tablespoons in. 2. Use lots of spice - don't be scared! I tend to use some or all of the following spices in my curries: coriander, cumin, garam marsala, indian curry powder, turmeric, ginger powder and fennel seeds. It is important to use lots of these spices to get enough flavour in the dish. Forget about using a few teaspoons. A few tablespoons is what you should be using. I tend to choose a couple of tablespoons of the dominant spices (for example cumin, coriander and garam marsala) and then less of the others. The spice mix needs to be fried up in the cooking oil or fat after onions, garlic and chilli have been sautéed. Remember number 1: use enough oil to keep the mixture moist. Some vegetables stew down to give a brilliant texture for curries. I recommend using pumpkin, eggplant, sweet potato and/or potato. This thickens the sauce and holds the spices throughout the dish beautifully. My mother (coincidentally!) was the first person to give me this advice and it was seconded by a chef at a pub that I worked at - use sweet and salt to balance curry spices. Sweet can come from anything - honey, jam or chutney. I often add a bit of sour too by adding a squeeze of lime or lemon. Then salt to taste. Keep tasting and adding sweet, spices and salt to find a balance that you like. This can take as little as 30 minutes with a vegetarian curry on a high simmer or a couple of hours if you are stewing meat. Look for the right texture with a thickened sauce and make sure all of the elements are soft and tender. As a final touch I recommend that you buy some pappadums and plain yoghurt to make your curry a real treat. One of the funnest parts of eating curry is dipping pappadums. If you have gone a little overboard with the chilli then the yoghurt will cool the dish down. For an added treat consider making a raiita with cucumber or buying some chutney to go with the dish. My tip for pappadums is to buy the cumin ones. They are delicious. So there you have it - they are my tips to creating your own delicious curry. I hope they motivate you to make one for yourself. Are you a big curry fan? Do you tend to order it as take away, buy pre-made or create your own? Do you have any tips of your own to share? All aboard the decluttering train!